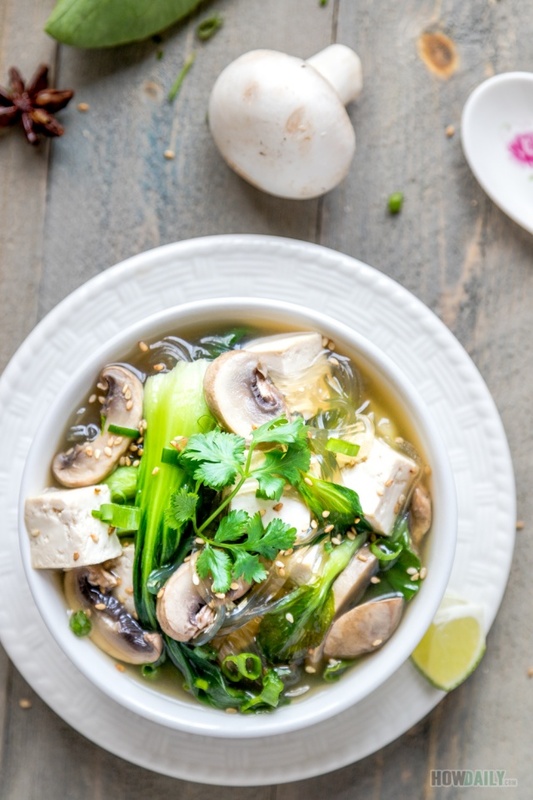 If you’re looking for a simple and quick to cook recipe, this soup is it. 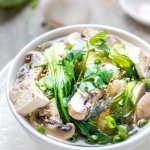 Not only is it vegan, this baby bok choy mushroom soup is gluten free as well. Best thing is, it just taste super with just right combination of everything. To make this truly vegan and gluten free, tamari soy sauce is used to avoid extra gluten. Also since baby bok choy carried natural sweetness, there’s no need add any extra sugar. Beside, tamari soy sauce gives the soup its nice brown caramelized color. On the spice side, star anise was added to enhance the flavor while providing anti-flu properties. Then there’s tofu for protein supplement and glass noodle to help you full. Glass noodles were chosen because they are wheat-free (look at the label) and doesn’t require as much pre-cooking/rinsing. However, you can also use ramen, rice vermicelli, just beware that some might contains wheat or egg. Chop baby bok choy in halves. 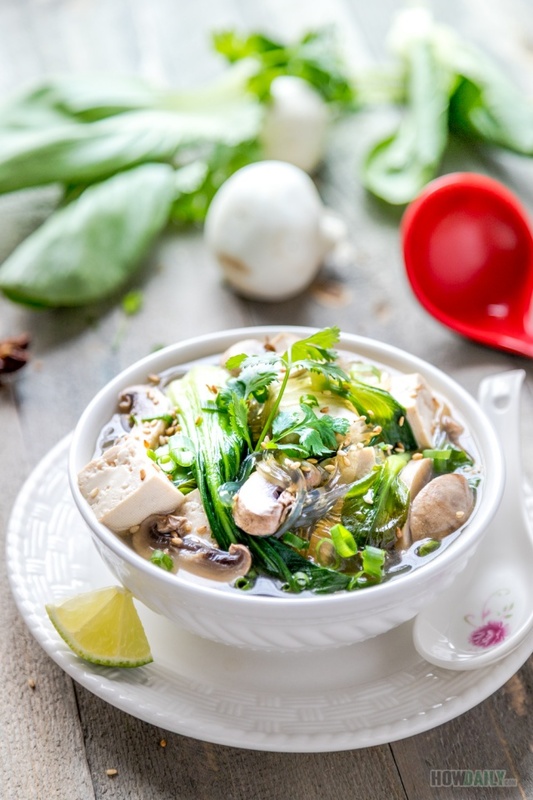 Slice mushroom, crush garlic and finely chop green onion (separately store green and white parts). With you stocking pot over medium-high heat, add 1 Tbsp cooking oil. When oil is hot, add garlic and white part of scallion. Stir to saute for 1-2 minutes till soft, then add tofu. Now pour in vegetable broth, add star anise and bring to boil. When boiled, add mushroom, then adjust heat to simmer for 10 minutes. Now add tamari soy sauce and adjust seasoning to taste. Add glass noodle to pot, bring to boil again. When noodle are cooked, add baby bok choy. Turn off heat and let rest for 10-15 minutes. Ladle into serving bowl, sprinkle with some green onion part and cilantro. Serve with lime wedge and roasted sesame sprinkle on top.